Pennisetum alopecuroides Viridescens is commonly known as Fountain Grass. It is a clump forming dense evergreen grass. It has arching flat glossy green leaves which turn golden brown during Autumn. 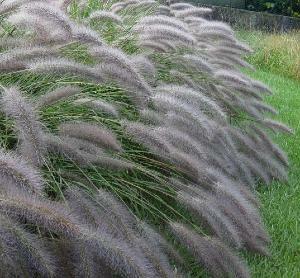 In late Summer and early Autumn it produces bristly purple black flower spikes. Likes moist but well drained soil in full sun. Can be tender in frost. Height 1m and spread 1m.